You may also like. 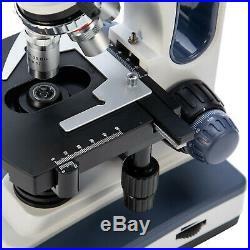 Swift SW350T 40X-2500X Trinocular Compound Lab Microscope Mechanical Stage WF25X. Biological Laboratory, Dental Laboratory, Family Medicine, Medical Laboratory, Pathology, Physical Laboratory. 4X, 10X, 40X (Spring), 100X (Spring, Oil). 1.3MP Digital Eyepiece Camera. Our favorite workhorse microscope, now upgraded for camera-compatibility! The Swift SW350T trinocular compound microscope features a dedicated camera port, making it the perfect instrument for clinical instruction, large science lectures, textbook compilation, or simply the serious hobbyist who wishes to take and share pictures of specimens. The SW350T keeps all the features of our popular SW350B: the interchangeable wide-field 10X and 25X eyepieces are mounted into a swiveling Siedentopf head, allowing for quick adjustments to suit different interpupillary distances without loss of focus. The four achromatic DIN objectives — 4X, 10X, 40X(Spring), and 100X (Spring, Oil) — combine with the eyepieces for 6 powerful magnification levels between 40X and 2500X. LED bulb provides steady, brilliant illumination fully controlled by the dimmer wheel and focused through an industry-standard NA 1.25 Abbe condenser and iris diaphragm. A large mechanical stage with moveable slide holder allows you to see the entire area of a specimen without reclipping. The SW350T also introduces a third ocular tube on which an additional eyepiece or a microscope camera (not included) can be mounted, allowing users to stream and record video as well as capture pictures of specimen images. What can you see with it? Compound microscopes offer detailed, cellular-level views of transparent or dyed specimens prepared and mounted on a slide. 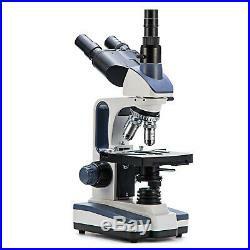 This microscope allows you to view samples such as bacteria, protozoa, and animal cells. For magnifying solid objects, use a stereo microscope. 30 degree inclined, 360 degree rotatable trinocular Siedentopf head. 1 pair Wide-field 10X eyepieces. 1 pair Wide-field 25X eyepieces. Adjustable ocular diopter: +/- 5dp. 4 Objective lenses: 4X, 10X, 40X (Spring), 100X (Spring, Oil). Stage x-y travel range: 70x30mm. NA 1.25 Abbe condenser with iris diaphragm. Coaxial coarse and fine focus knobs. Transmitted illumination with 1W LED bulb, adjustable brightness. Power supply: 110-240V power input. 1 pair WF10X eyepieces. 1 pair WF25X eyepieces. 1 sample immersion oil. 1 1.3MP Digital Eyepiece Camera. For over fifty years, Swift Optical Instruments has been a global leader in the manufacture and production of quality microscopes. Swift microscopes are manufactured, to our specifications, by carefully selected and monitored factories in China. Our constant commitment to enduring quality and technical excellence ensures that you are getting the best product for your budget and application. Each instrument is inspected for quality assurance. We are not responsible for any wrong or undeliverable addresses. International Buyers – Please Note. We offer 30 days from the date of receipt (verified by tracking information) to request a return on a unit. Your better comments will be an encouragement for us to offer the better quality and the better service in future. We shall try our best to solve your problem to your satisfaction. A powerful multi-purpose compound microscope for viewing tiny details of specimen slides; excellent for clinicians, high school and university science students, and enthusiastic hobbyists alike Professional Siedentopf head is fully rotatable for shared use and equipped with interchangeable wide-field 10X and 25X glass eyepieces fixed at an ergonomic 30 degree tilt to reduce neck strain, easily adjustable for different interpupillary distances without losing focus 4 DIN Achromatic objectives mounted in a revolving turret offer 6 magnification levels: 40X, 100X, 250X, 400X, 1000X, 2500X The brilliant LED bulb transmits light through an Abbe condenser, illuminating slide specimens from below with adjustable brightness. 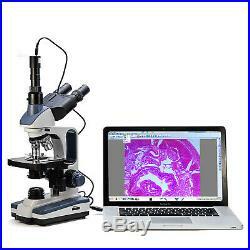 Swift SW350T 40X-2500X Trinocular Compound Lab Microscope w/1.3MP Digital Camera. 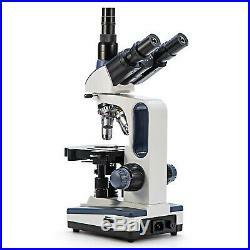 Swift SW350B 40X-2500X Compound Biological Microscope Binocular Mechanical Stage. 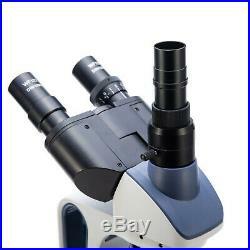 Swift SW150 40X-1000X Compound Student Microscope Monocular Science Lab Biology. Swift Kid SW100 40X-1000X Compound Beginner Microscope Science Dual Illumination. 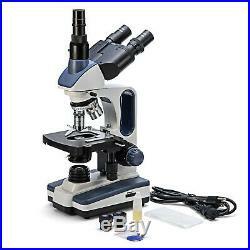 Swift SW200 40X-1000X Compound Lab Microscope Biological Science Student WF25X. 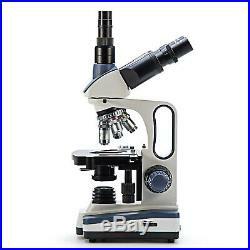 National 40X-1000X Biology Science Metal Glass Student Microscope w/ USB Camera. 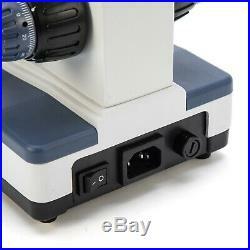 National 40X-1000X Microscope Camera Student Biological Compound Cordless LED. 25/50/100Pcs Prepared Microscope Slides Professional Plant Animal Specimen Glass. 1.3MP USB Digital Eyepiece Camera Still & Live Video Imager for Microscopes. 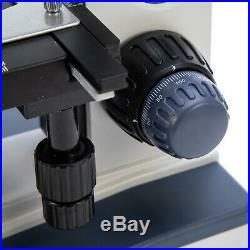 USB Digital Eyepiece Camera Still & Live Video Imager for Microscopes 0.3MP. 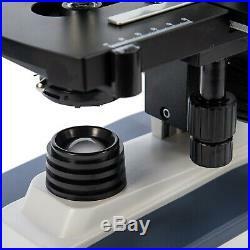 NationalOptical 40X-1000X Student Biological Compound Monocular Microscope WF25X. 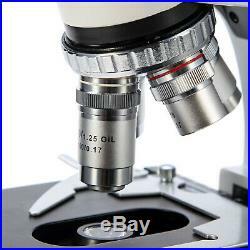 72 Pieces Pre-Cleaned Blank Microscope Slides +100 Pieces Coverslips Cover Glass. 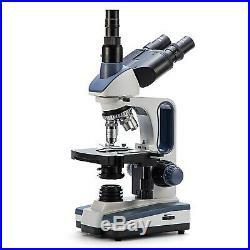 The item “Swift SW350T 40X-2500X Trinocular Compound Lab Microscope with1.3MP Digital Camera” is in sale since Friday, March 1, 2019. This item is in the category “Business & Industrial\Healthcare, Lab & Dental\Medical & Lab Equipment, Devices\Microscopes”. The seller is “swiftopticalus” and is located in Los Angeles, California. This item can be shipped to North, South, or Latin America, Australia, Russian federation.